This cute little palette contains two eyeshadow-type formulas – one dark and one light – as well as a brown cream, highlighter, pink base, mini tweezers and cute little black eyeliner… basically everything you need to create the perfect brows. I’ve got a couple of other brow palettes but clearly don’t ever use them. This one from Benefit is not only easy to use, but the products it contains are complementary to each other and not overwhelming. The little brush you get is perfectly shaped to ‘draw’ on the inner part of your brows – you don’t have to ‘shape’ it as the end of the brush forms it perfectly in a couple of strokes. This matched with the brown creamy gel to define the end of the brows means you’ve got perfect hairy bits in literally a few seconds. The highlighter can be used just under the brow to catch the light and sculpt the eye, while the tweezers and liner just put the cherry on the cake. This little palette has become a staple for me in the last few weeks. It lasts practically the whole day (with a primer) so you can rest assured you won’t have a wonky brow by lunchtime. At £22.50 I don’t think this is bad value for something that actually contains six different elements – especially when you will use it every day. I love the brush as it makes the whole process much easier (I’m rubbish at sculpting or anything like that) so I feel comfortable giving it a whirl. 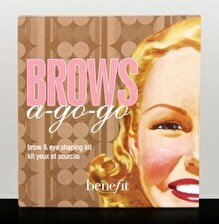 Brows a-go-go is one of those rare products I’ll definitely re-purchase when it runs out. I use this everyday and I have no complaints at all, it's great!! I think it's fab. Just the right colours and formulas.